Abersoch: Accommodation, Attractions, Activities, Going Out, Shopping, Things to Do, Places of Interest, Outdoors, Abersoch Holidays, Abersoch Area Location, North Wales. Abersoch is situated on the Llyn Peninsula in North Wales and has become a very popular village seaside resort around all year. Abersoch offers great beaches, internationally recognised sailing waters, windsurfing and surfing, beautiful scenery and pleasant climate. There is a good selection of restaurants, pubs and shops in the village. Abersoch and the Llyn Peninsula is an ideal spot for watersports enthusiasts (wakeboarding and waterskiing , sailing , powerboating and windsurfing) with locations, shops and conditions to satisfy them all! Surfers and bodyboarders are catered for at Porth Neigwl (Hell's Mouth), Porth Ceiriad and Porth Oer. National and also international Regattas are often hosted in Abersoch and Pwllheli area. Water quality in the bay is very good; water quality at Porth Neigwl is one of the best in Wales according to the Environment Agency. Ynys Enlli / Bardsey Island: Also knows as The Island of Twenty Thousand Saints (a focal point for the Celtic Christian Church). Carreg: viewing point overlooking Porth Oer. Uwchmynydd: Fantastic views from here of Ynys Enlli. St. Tudwal's Islands: The Islands visible from Abersoch Bay. Porth Ysgo: small beach, waterfall and old mine workings with nearby Porth Cadlan - they say, the possible location of one of King Arthur's battles. Mynydd Rhiw: The mountain that overlooks Porth Neigwl offering tremendous views from both sides. Carn Fadryn: Great views from the mountain at the centre of the peninsula. Plas Yn Rhiw: historic house and gardens. Abersoch Virtual Guide Accommodation Guide, Events, Services, Activities, Watersports, Nightlife, Shopping, Eating Out. Llyn Peninsula Seaside Village Abersoch Virtual Tour, e-cards, Attractions and Events. Abersoch Holidays Holiday Accommodation, Caravans, Cottages, Farmhouses; Availability and Tariffs, News and Special Offers. Llyn Golf Course Outdoors in Abersoch. 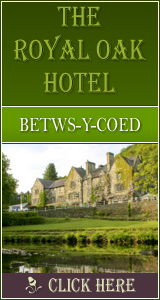 Porth Tocyn Holiday Accommodation 3-star Hotel.